The Stuttering Foundation, a charitable organization dedicated to stuttering research and training programs since 1947, offers continuing education courses for ASHA CEUs online. These courses, developed and led by world renowned experts in the field of stuttering, are offered at low cost to speech-language pathologists (SLPs) worldwide. Participants will learn key concepts related to the principles and science of behaviour change in the context of therapy for stuttering. A methodology is presented to understand behaviours, conduct behaviour analysis, engage in systematic intervention design, evaluate intervention effectiveness, and refine interventions for maximum effectiveness to improve stuttering therapy. In this 2 hour presentation, Vivian Sisskin, M.S., CCC-SLP, from the University of Maryland, summarizes the literature pertaining to disfluency in autism, and provides basic principles to aid in differential diagnosis and treatment planning. A case study, demonstrating effective treatment for final part-word repetitions, highlights a problem-solving approach to clinical management, using both learning style in autism and strategies from traditional fluency therapies. Vivian Sisskin, M.S., CCC-SLP, University of Maryland, walks clinicians through methods of group therapy while providing the nuts and bolts of Avoidance Reduction Therapy. 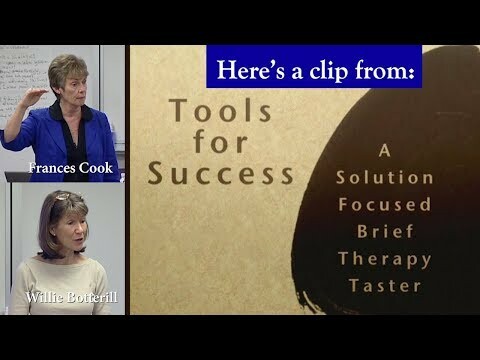 This 2+ hour video course demonstrates speech management strategies to help you work effectively with children and adults who stutter. 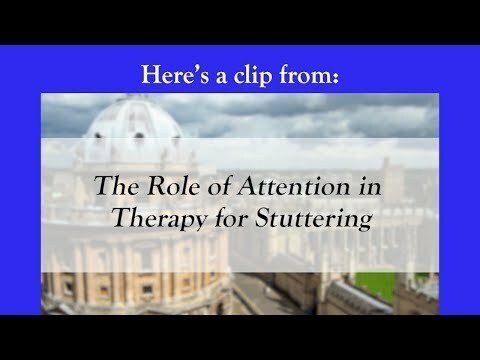 Dynamic demonstration of stuttering therapy techniques by experts from around the world. 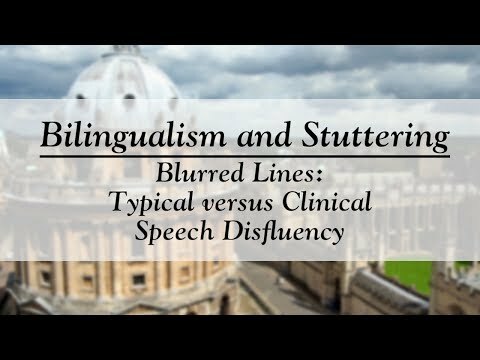 In this 1 hour presentation, Courtney Byrd, Ph.D., CCC-SLP, of the University of Texas at Austin, sheds light on differential diagnosis of stuttering particularly when clinicians may be misled by similarities in the speech behaviors produced. Participants will learn key differentiating characteristics and areas of overlap, along with other critical assessment considerations that will enhance their competence and confidence in their evaluation of speakers for whom there may be an increased risk for misidentification of stuttering, with an emphasis on assessment of speakers of more than one language. This 42 minute program, written and narrated byFlorence Myers, Ph.D., and Kenneth O. St. Louis, Ph.D., features people who clutter and clearly illustrates the essence of cluttering as well as the problems that often accompany it. Strategies and suggestions for diagnosis and treatment of cluttering are provided for speech-language pathologists. For clinicians who have been confused about how to identify, assess and treat cluttering, this 76-minute video provides practical strategies for understanding and managing complex clients. Desensitisation has long been recognized as an important component of therapy for children who stutter. In this 1-hour presentation, Elaine Kelman, MSc, Cert MRCSLT and Ali Berquez, MSc, Cert MRCSLT, of the Michael Palin Centre for Stammering in London explore the process of desensitisation and its potential benefits for parents and their children who stutter. The construct of desensitisation is defined and a description given of how traditionally it has been incorporated into therapy with adults and children who stutter. They discuss the rationale of desensitisation and the benefit of including parents of children who stutter of all ages in the therapy process. They present research evidence about the impact of a child’s stuttering on parents. The presentation focuses on clinical methods for desensitising parents of children who stutter using examples of activities conducted in group and individual therapy with parents at the Michael Palin Centre in London. 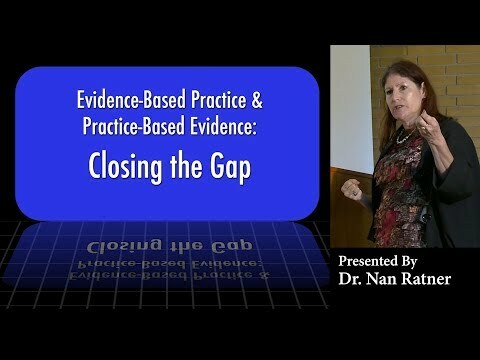 In this presentation, in an effort to frame these claims more positively, Dr. Nan Bernstein Ratner, Ed.D.,argues that there is both research and common-sense evidence that these claims are wrong. She also suggests that in the debate about best practices in fluency treatment, there is indeed a need to search out and integrate many sources of evidence that either support our approach to a case or suggest a need for reconsideration, adjustment or change. 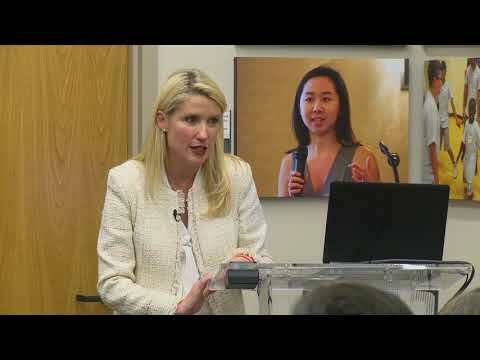 In this 2-hour, 55 minute video, renowned clinician Vivian Siskin, M.S., presents a multidimensional approach as a foundation to help children address thoughts and feelings that sometimes co-exist with stuttering. She offers concrete strategies to help children become more mindful about communication, to answer others' questions about what stuttering is and why they talk the way they do, and to recognize how feelings influence their behavior. 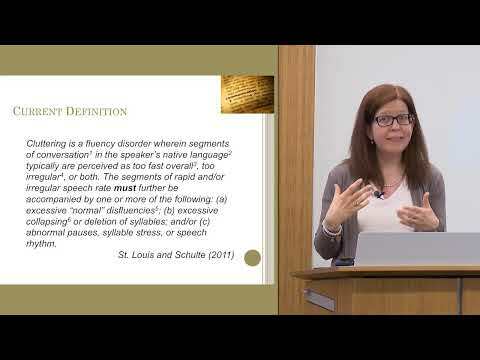 Many methods have been developed to count speech disfluencies and in this 1-hour program clinicians are trained to differentiate between various types of disfluencies, code them, and analyze the data accordingly. While this is just one aspect of a comprehensive fluency assessment, it is important to obtain reliable frequency measures for assessment purposes as well as to determine treatment effectiveness. 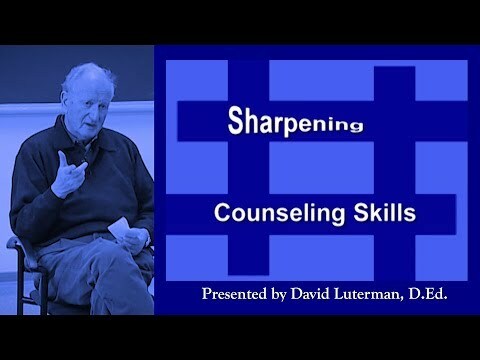 This exciting 3 hour video program features renowned audiologist and expert counselor, David M. Luterman, D.Ed. Luterman's philosophy of counseling centers around deep listening and silent witnessing of our clients' stories and concerns as we refrain from providing immediate advice, information, or solutions. 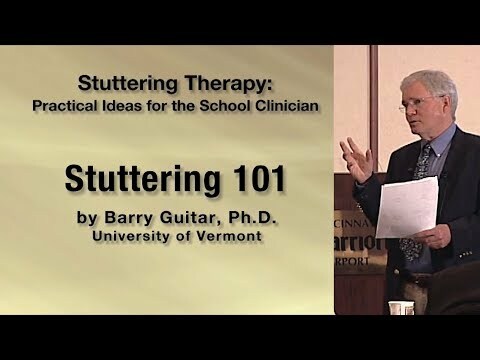 Barry Guitar, Ph.D., of the University of Vermont describes the differences between the two primary approaches to speech modification: fluency shaping and stuttering modification. 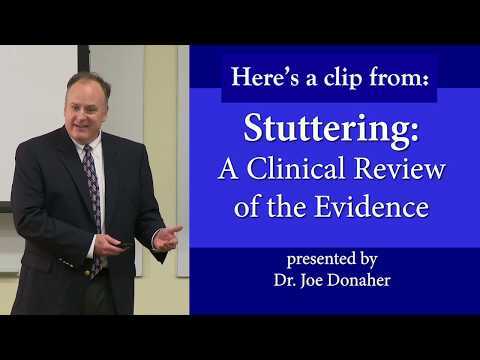 In this engaging 77 minute lecture, Dr. Joe Donaher of the Children’s Hospital of Philadelphia provides a framework for clinicians to view childhood stuttering from an evidence-based perspective. He presents the latest research in stuttering onset and development, genetics, neurophysiology, and speech motor control. He then helps clinicians understand how to apply this information to the children on their caseloads through the use of several case examples, emphasizing the importance of viewing each child as an individual and creating a strong therapeutic alliance. This 4th edition by Barry Guitar, Ph.D., explains how speech-language pathologists can combine the different but most commonly used treatment procedures to get more effective results in working with those of all ages. Harley first explores some key concepts related to attention, including: selective or broad focus of attention, ‘bottom-up’ and ‘top-down’ attention, and attention bias. She then presents examples of clinical interventions which help clients to shift their focus of attention in relation to children and also parents. The concepts of mindfulness, of stepping back from thoughts (defusion), and of self-compassion are discussed. Now you can earn CEUs for The School-Age Child Who Stutters: Working Effectively with Attitudes and Emotions Workbook. The workbook offers you a powerful tool for stuttering diagnostics and therapy, focusing exclusively on assessing and treating feelings and beliefs in school-age children. 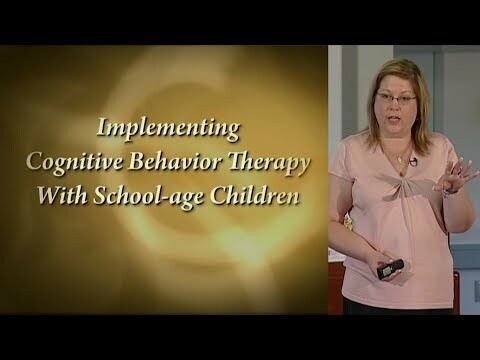 This 4 hour video taster into cognitive behavior therapy explores the interaction of thoughts, feelings, physical reactions and behaviors from the perspectives of children, parents, and therapists. Ways to use the cognitive model are discussed. 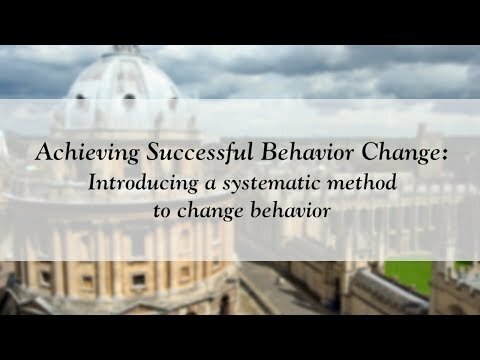 This taster introduces viewers to the principles and practice of SFBT, providing examples of children, parents, and teenagers describing their "best hopes" for the future, using scales to determine the skills and resources they already have to attain that future and identifying the small signs of change along the way. This outstanding self-directed program based on the book by Carl Dell, Ph.D., describes how speech-language pathologists can work effectively with school-age children who stutter. This course is offered for 0.4 ASHA CEUs (Intermediate level, Professional area). 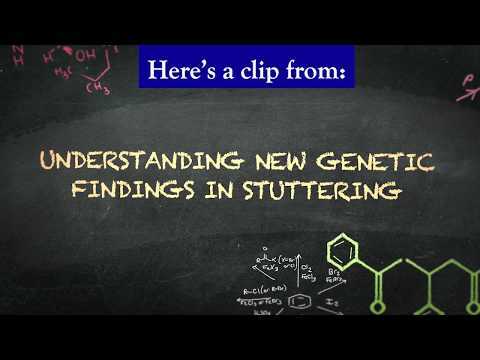 In this 72-minute DVD, Dennis Drayna, Ph.D., of the National Institute on Deafness and Other Communication Disorders, provides an update on recent research findings in the genetics of stuttering. Increase your confidence and flexibility in teaching students to modify their speech behavior! 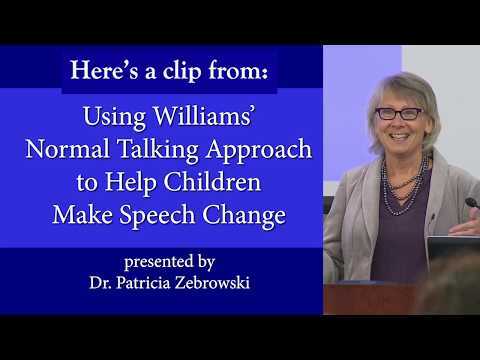 In this 153-minute video, filmed at the Stuttering Foundation’s 2014 two-day conference on working with the school-aged child, Dr. Patricia Zebrowski describes how to teach children to make speech change using Dean Williams’ Normal Talking Approach as a foundation. 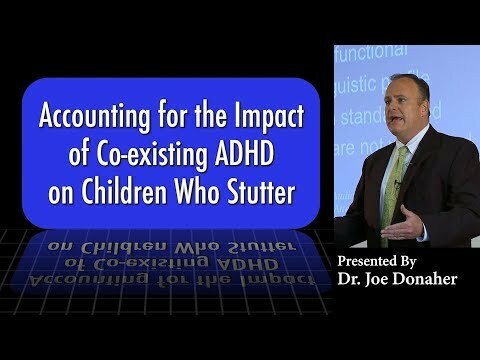 Then, Dr. Zebrowski reviews the various speech modification strategies clinicians can use with children who stutter, including what each technique is designed to change within the speech system and how to use apply the technique in therapy. Improve your ability to treat stuttering in preschoolers. This one hour and 45 minute program with corresponding handout offers comprehensive and practical strategies for working with young children. Featuring Kristin Chmela, M.A., speech-language pathologist and Board Recognized Specialist in Fluency Disorders.